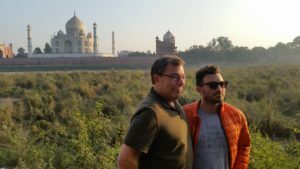 This was my eighth trip with Overseas Adventure Travel and as you’ll see from the photo I brought along my 32 year old son. 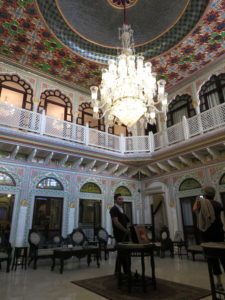 Interestingly, there was another parent traveling with her adult daughter (slightly older) on this trip to India. SEE MY NOTE UNDER TIPS …. they had a really good idea. My comments on this trip continue below. If you are considering the Heart of India Tour with Overseas Adventure Travel (OAT), feel free to take advantage of this special savings. When making your reservation, simply say you were referred by Jesse Slome (Customer Number 932019) and they will deduct $100 off the lowest available price. This works just one time on your first trip. No catch and it’s just for your first trip. Okay … you want an adventure … this is it. This was by far one of my favorite (if not the favorite OAT trip). That said, I use one word to describe India. “Overwhelming”. The noise. The honking. The traffic. The crowds. The dirt. The air. YES … it’s overwhelming and I can clearly see why I’ve heard of people who landed in Dehli and booked a return flight within a few hours. BUT … if you can just relax and experience what’s taking place around you … this will be the trip of a lifetime. To be honest, it took me a while (almost to the end of the trip to stop being a judgemental American). I am so glad I did this trip. You’ll be busy and active (unlike some other trips where I’ve shared there can be a little bit too much downtime. 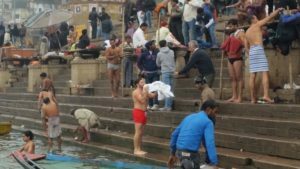 holy Ganges with the locals (I didn’t but my son did) … you will. You want to see a tiger in the national reserve. You well might (we did) thanks to the very persistent driver who never gave up and then scurried back to the park entrance to beat closing time. This is a well organized very comprehensive tour. 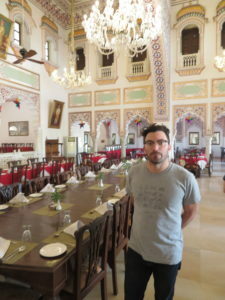 The hotels were good. The meals were good. No one suffered from Dehli belly (well, we got sick but I think that was because we passed around a bug). I don’t want to write a book here but the photo is taken at one of the lunch stops we made. If you have any liking of Indian foods … imagine a limitless supply of hot naan breads being served straight from the oven. This was another. 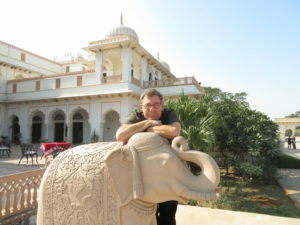 Now … I want to repeat … India will overwhelm your senses while you are there. At least it did mine. But suspend all that you deem appropriate. The roads are filled with cars that beep their horns incessantly. The cows and dogs and people don’t even seem to notice. And, when you are back home, you will remember this adventure to another world for a very long time and (like me) in an incredibly fond way. 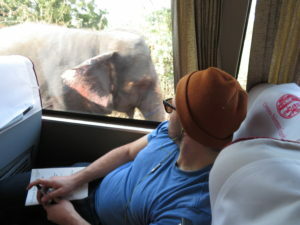 Because how many times will you be sitting comfortably on an air conditioned bus when an elephant strolls by in the next lane? I mentioned the mom and daughter did something smart. They took advantage of the fact that OAT offers single rooms at no extra cost (so they each had their own room). These aren’t available on all trips … but I thought it was a great idea worth sharing. Feel free to contact me with any questions. As I’ve mentioned, while I don’t work for OAT (or Grand Circle) I clearly like them … and I’m proud to have referred many travelers who have written to me. You can E-mail me at jslome at aaltci dot org or JUST CLICK THIS LINK. And, if you do book a trip and use my Referral Discount Code, I’d love to say thanks 🙂 Happy travels.